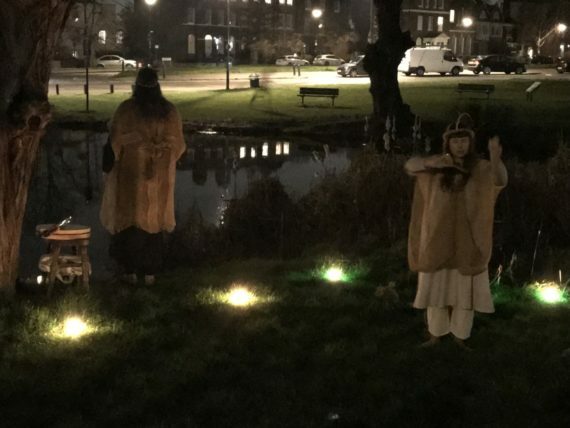 Imagining the lost creatures and local spirits of Blackheath. 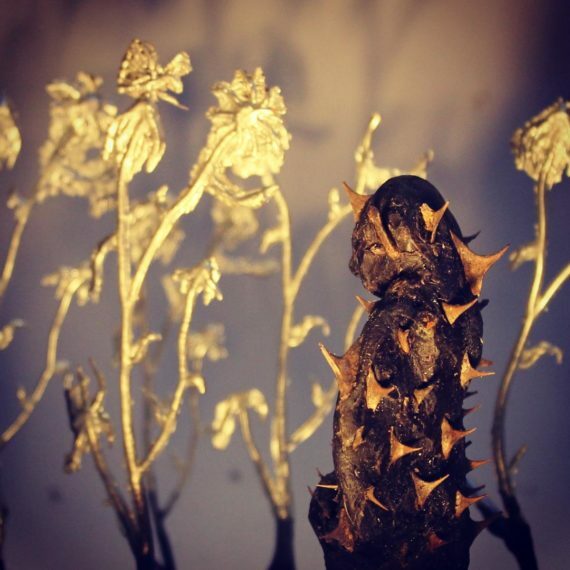 The White Box Gallery, 4 Hare and Billet Road Blackheath SE3 0RB from March 1st to 10th. 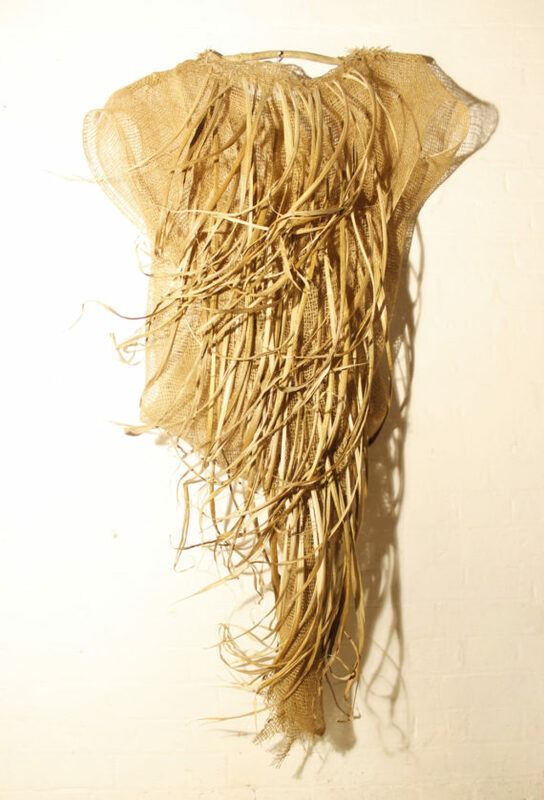 We first met at APT Open Studios when they were part of APT Live curated by David Bloor and Lulu Richards Cottell. They visited my studio and said they’d be interested in working with me in the future. I went to two of their performances and I was transfixed by what they did. I asked if they would perform for Otherworld and we met up in The Hare and Billet Pub by the gallery (opposite the pond) in a snow storm to discuss it. The next meeting was in the pouring rain in my studio when we discussed how flexible and warm what they wore needed to be. 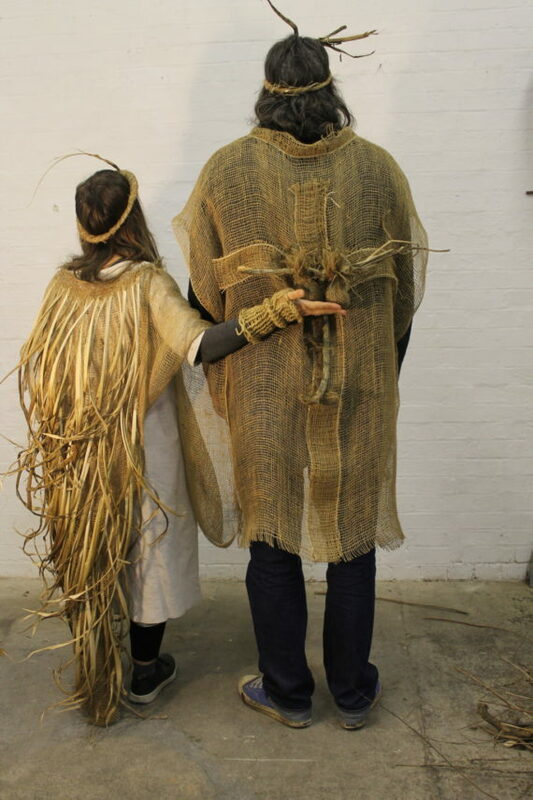 I made sculpture-to-wear for them after gathering natural materials from the pond (the weirdly shaped bulrush roots and reeds which had been torn up by gardeners) combined with hemp fabric. 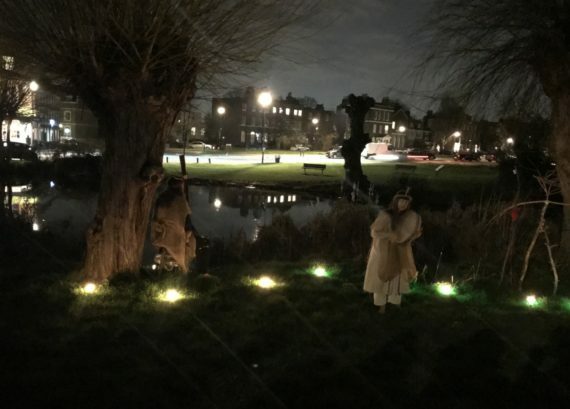 For the performance on the dark cold night of March 1st we gathered around The Hare and Billet Pond in an area between two willow trees which was lit by candles. Sound was the most important thing. The cars continued to race around the triangle of roads surrounding it but we could all focus on the haunting words sounds and music. It doesn’t feel right to describe it further, originally I was for not recording it at all so that we could only experience it first hand. Two local vicars were there. One was the vicar of the local church right on the heath overlooking the pond. 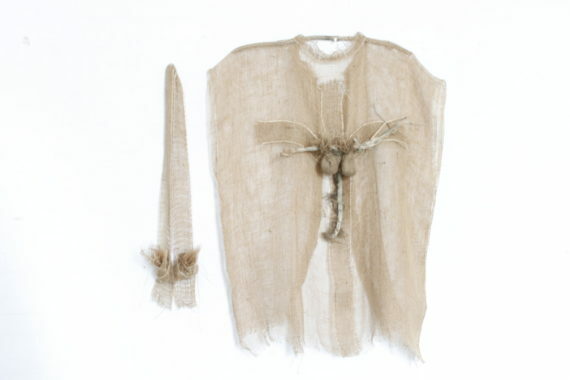 He was asked by if he objected to what seemed a pagan ritual and replied “No they were channelling God”. The exhibition continues Thursday 7th March 11-5pm, then Friday Saturday and Sunday 11-6pm. Blanc Sceol will perform to close the Otherworld exhibition at 4pm on the pond. Studied Banbury School of Art, Newcastle University, Kingston University. Based at APT Studios Deptford, London UK.